So the Brooklyn Nets lost two players in the brawl that began with a hard foul by Kris Humphries on Kevin Garnett. Rajon Rondo lost his head and got ejected, which destroyed any chance the proud but simply not-so-good Boston Celtics had of beating a better team. 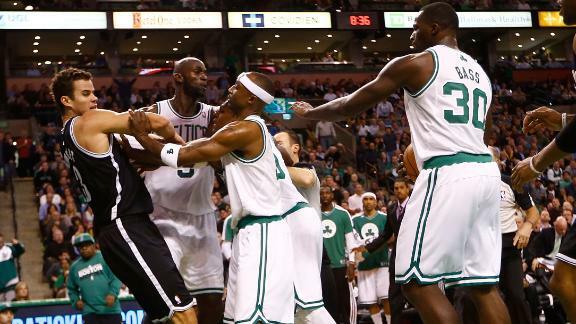 It was already not that close of a game when Humphries hacked at Garnett who fell down. Surprisingly, Garnett didn’t do much during the whole scene. Rajon Rondo has some sort of special bond with KG, but he forgot he was on a basketball court and decided to get in Humphries’ face. The former Mr. Kardashian took over from there, and Gerald Wallace also joined in on the action, getting himself an ejection as well. There was some basketball in this game, and it was mostly by the Brooklyn Nets. Doc Rivers keeps telling his players they can win because they’re tougher and smarter than other squads out there. He’s plain lying to them. They have Rajon Rondo as their superstar, and Kevin Garnett and Paul Pierce who are good on most nights. That’s not enough against elite teams in the NBA; not even enough against the Brooklyn Nets. The Nets are an awful team from the field, but when the Celtics lose all energy in what was supposed to be game in which they prove they can hang and be physical like other teams, open shots from beyond the arc are simply too much to recover from. Joe Johnson led the Nets with 18 points while Andray Blatche and Jerry Stackhouse both scored 17. Stackhouse and Johnson combined for 8-12 from beyond the arc. All this talk about how the Nets aren’t deep goes out the window each time. Their starters didn’t produce the fireworks and the goods, and for (not the first time) the win, they needed Blatche, Stackhouse, C.J. Watson and Reggie Evans to pull them through. Their starting five shot 32.6% from the field, and they still manhandled a Boston Celtics team that simply has no business thinking about wins and playoffs when they don’t have Rajon Rondo on the floor. It might be worrying that Deron Williams is struggling with his injury, and it might be a good idea to give him some rest. The Nets are off to a 10-4 start, probably better than what most expected them to come up with during their first season in Brooklyn. They’re proven in this short time that they’re the best team as of now in the Atlantic division. With the Knicks going back to their old ways and the Chicago Bulls still trying to find themselves without Derrick Rose, the number 2 spot in the East seems to belong to the Nets at the moment. Giving Williams a little rest instead of 40 minutes a night on bone pieces should do him some good. This is a 82 game marathon, not a sprint. And for the Boston Celtics? Someone said before the season began that they are the only team that still sees them as title contenders. Doc Rivers is preaching that to them, about being tough and physical and smart. Maybe they’ll start believing that eventually, maybe even play like that. But it’s hard facing reality, even against a far from perfect team like the Nets. Especially when your best player forgets this is a game of basketball and not some street brawl.